For all those who besides PANTHEON use any additional, external (vertical) solutions, we want to ensure the best possible services in the future also. Therefore, we introduce the Connector License which enables users access to PANTHEON database. Excel applications (whenever the XLS file automatically connects with the PANTHEON database). 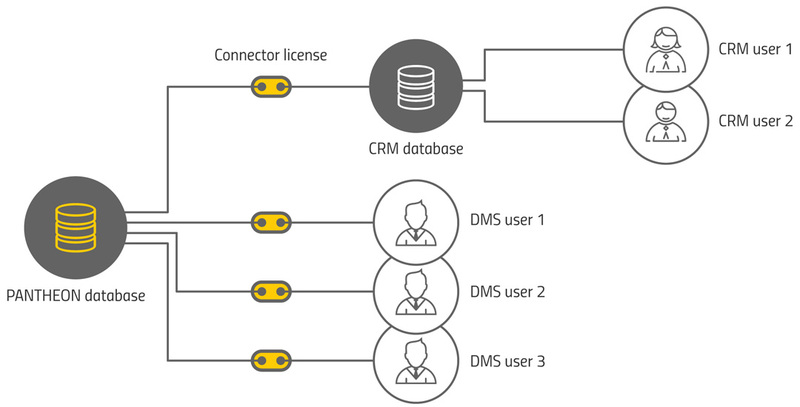 The Connector License is not required , if the user is logged into PANTHEON with a username and password and imports data from the external solution (CRM, WMS, XLS, Word, etc.) to PANTHEON or exports them from PANTHEON to the external solution (CRM, WMS, XLS, Word, etc.) using a corresponding command. A Connector license is not required when using other Datalab solutions. It is not application-specific, therefore a customer may have a set number of Connector License licenses for all vertical solutions. It is linked to the serial number. The application allows simultaneous users, which means that you require as many Connector License instances as there as simultaneous users of the vertical solution that are connecting to the PANTHEON database. The WMS does not use a separate database, therefore warehouse managers use real-time data from the PANTHEON database. In such a case as many Connector License instances are required as there are simultaneous users of the WMS vertical solution at the warehouse. That is, 3 licenses. The CRM software uses a separate database which connects with the PANTHEON database. 1 Connector License instance is required for the connection. The CRM system enables any number of simultaneous users making changes to the CRM system database in real-time. The PANTHEON user in figure requires 4 Connector license instances. The license cannot be exchanged for other types of PANTHEON licenses. The Connector License localization version must be consistent with the localization of the main license. In contrast to the main software package licenses, where up to 50% of their value can be frozen, this cannot be done with Connector License. For all information regarding the exact number of required connector licenses and for an offer, please contact your authorized Datalab partner or contact us with your questions.